39W – 850mm/34” (l) – 5/8”- 16 mm (w) Using an iQuatics T5 Reflector alongside your fluorescent tubes can increase the output by up to 100%, thus making your fluorescents more efficient. 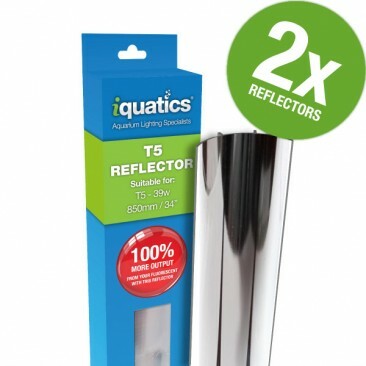 Brilliant reflectors, very good quality and sturdy, easy to fit. Wish that I had come across these years ago. The service from Iquatics was great also. Top quality product,that’s eight I own now ???? Was surprised that the quality was so great compared to the price, got more then expected! and the delivery was incredible quick! Bought mine from Amazon, they arrived very quick and I would say an excellent product. 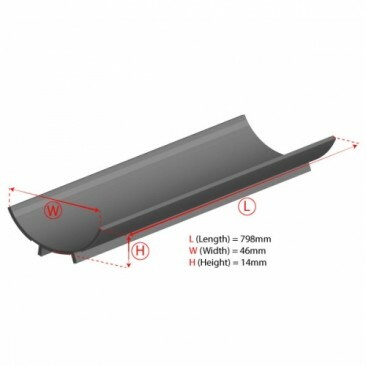 This product fits perfect and gives extra light into the tank. I would recommend this to anyone. I was expecting to get those flimsy reflectors that are made out slightly stronger tin foil. However these are different. They are solid metal and take an insert for a strip of that tin foil type material. So you can replace strips rather than the whole reflector. And from the top, they look really good giving the aquarium a real quality feel when you lift the lid. Buy these! These reflectors are well worth the money. Make an amazing difference to my lights. Fantastic service from iquatics. Great price and fast delivery. Will be shopping here again. These reflectors have made my tank look great , even my wife noticed the difference. Exellent value and quality as have been all the purchases I've made. Excellent quality, the metal clips are a godsend! plastic clips just break! These are much better than I expected them to be, the best aquarium reflectors I have ever used by a long way.